Hi newmay. Apparently, there is a communication breakdown between the 2 offices. You are eligible for the early bird promo, so don't worry about it as they have sorted it out. Try calling back the office again. You are eligible for the early bird promo. Yes. You just head to Treasure Cove on 7th floor to register the tourney. What's ur name btw? I just confirmed my ticket. Will be departing from TMFT at 11am. Since the main event starts at 1pm right? I am also in for the early bird promo. I like the extension charge waived. seem like the response is not as good as previous one, however I'm still in for the first time and made the cabin deposit to Johor's Office already. Just to double confirm again, this series events champion and 1st runner up come with the entry of Bonanza Main Event worth SGD$888 ? 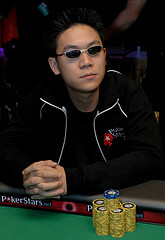 It depends on the amount of participants whether we will give away one or two seats to the CNY $888 tournament. We will be announcing that on board during the tournament proper. 2 of us playing Wonder how many are going and not posting on this forum.. How many participants were there for the last month event? LWPS I had a $200+ buy in, and had 120 runners for the main event. LWPS II had a $400 buy-in, and had a main event field of 60 runners. ikelos wrote: LWPS I had a $200+ buy in, and had 120 runners for the main event. LWPS II had a $400 buy-in, and had a main event field of 60 runners. so i guess this time around 90 runners? Sorry, here is my question again. 1. Extension Fees - Waived? I called to the Johor office as I'm fr Malaysia, they have mentioned only qualified to Day 2's players in the main event will be waived for the extension fees which is diff with "all $20 extension/overstay charges will be waived!" ? 2. Extension for those who not joining main events? My friend is going with me, but he might not playing main events and only for cash game/SNG. Can he qualified for the extension fees too? Otherwise we have to leave together. newmay wrote: Sorry, here is my question again. 1) This is not correct. As long as you are registered for the early bird, your extension charges WILL BE WAIVED regardless. Do approach any of the Pokerkaki team when you're onboard, and we'll have the matter resolved for you. 2) Unless your friend plays the main event, he will incur the overstay charges unfortunately. Playing the Main Event has to be a criteria, to ensure that the promo is not subject to abuse.